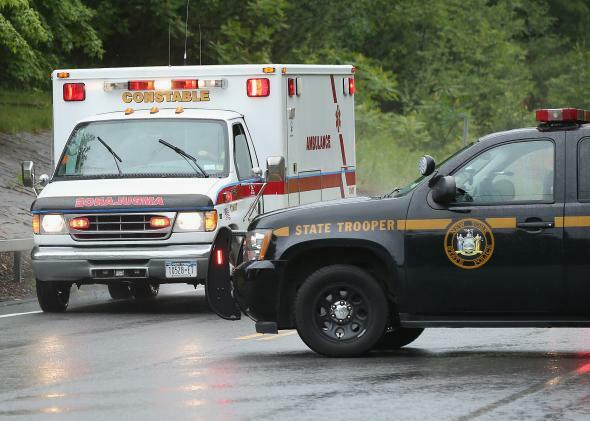 An ambulance, believed to be transporting convicted murderer David Sweat is escorted by N.Y. State Police to Alice Hyde Medical Center on June 28, 2015 in Constable, New York. Mr. Sweat, 35, was alive and in custody, Sheriff David Favro of Clinton County said. He was taken to Alice Hyde Medical Center in Malone. His condition was not immediately available. The shooting occurred after a State Police sergeant saw Mr. Sweat walking down a road toward him, according to one person with knowledge of the matter. The sergeant ordered Mr. Sweat to stop, but he broke into a run and the sergeant, a firearms instructor, opened fire, the person said. It was not immediately clear how many shots were fired or whether Mr. Sweat was armed. Earlier today, authorities said they were close to catching Sweat after finding his DNA near the location where his fellow escapee Richard Matt was killed in a confrontation with border patrol officers on Friday.